5 Cravings Killing Tips For Women Overwhelmed by Their Addiction To Cake, Chocolate & Biscuits! Cravings are the DEATH of your good intentions whilst trying to manage your body shape. 1. Your brain/body craves NUTRIENTS not Percy Pigs 🐷 You’re not programmed at birth to desire soft, sweet pink and white sweets from M&S. Even if you are VEGAN they are not a replacement for the nutrients your body truly needs. FIX: Feed your body a WIDE range of nutrients from unprocessed foods and you’ll remove the uncontrollable urges to scoff 3 bags of pigs in one sitting! By definition diets are about depriving your body of certain nutrient groups. Problem with that is as you deprive your body of entire macro-nutrient groups, the brain starts sending signals that you’re hungry and needs energy to keep you alive. 3. Fasting, Cheat Meals, Sweet Treats, calorie counting ALL create cravings. There’s a reason it’s ‘normal’ to eat three meals a day. It creates habit and a system that shouldn’t require too much thought. If you’re adopting a nutritional protocol that is not sustainable long term, then it’s not a good protocol. I know you’ve got Domino’s on speed dial. And that “Just Eat” app is WAY too handy. But there is a quick way to conquer that craving in just 4 minutes. Chuck a load of butter in the pan and let it melt, add the spinach. DONE. Eat it. Cravings Killed! Sugar addiction is purely bad management of your body’s insulin production. Within reason, you start each day from zero, so feed your body something that’s NOT going to spike your insulin. This means avoid cereals, toast, croissants, muffins, breakfast bars. If you do eat this stuff, Guaranteed you’ll be kicking the window down on the office snack machine before 11am. Instead consume low carb, high fat and protein based foods for breakfast… Scrambled eggs with spinach and/or smoked salmon is my breakfast of choice. That’ll keep you right til’ lunch easily. The idea is simple... give your body the nutrients it REALLY craves, and your cravings 'gland' stays silent all day long. Whilst the product is great for conquering your cravings, it also provides your body a solution to excessive bloating, gives you a natural energy boost, and cleans up your toilet habits too! Spin the tub around you'll find a whole bunch of crazy healthy sounding ingredients, you'd be convinced it'll taste awful. But that's where the magic is! We've worked super hard to make the taste as NEUTRAL as possible, making it easy to mix in just cold water, or added to your morning juice or smoothie. We want it to become part of your daily habits just like brushing your hair and cleaning your teeth, so it has to be palatable, otherwise you'd never drink it. 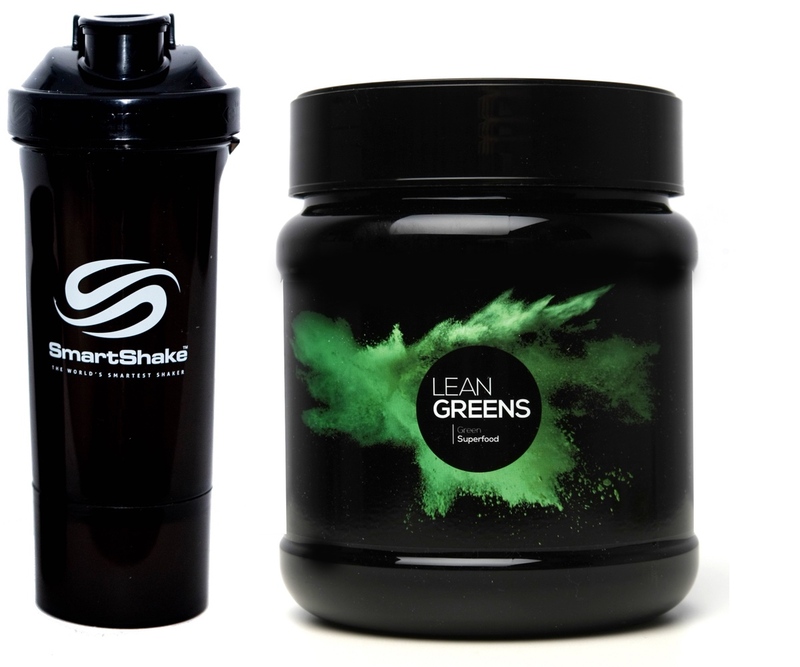 We've even created an awesome starter pack for you to trial Lean Greens. 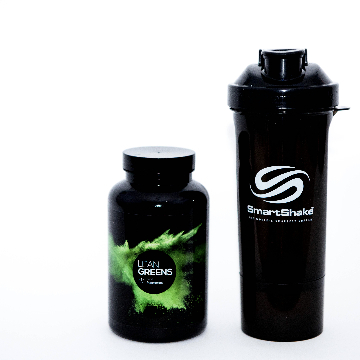 It comes with our favourite shaker to mix the potion up perfectly every time... and with 2 weeks supply, plenty of chance to see your cravings disappear, and your energy and vibrancy return. Don't mistake this for one of this nasty Meal Replacement shakes... this is something you'll ADD to your normal healthy diet, topping up where you may miss your 5-a-day. The only thing you'll replace is the trip to the snack machine in your office, or the cake display in the coffee shop. Experience the full benefit of pounding your body with nutrients on a daily basis with our 2 week trial pack. These three 30 Day products will help your digestive system work at it's peak, with less bloating, zero cravings and healthy bathroom habits. 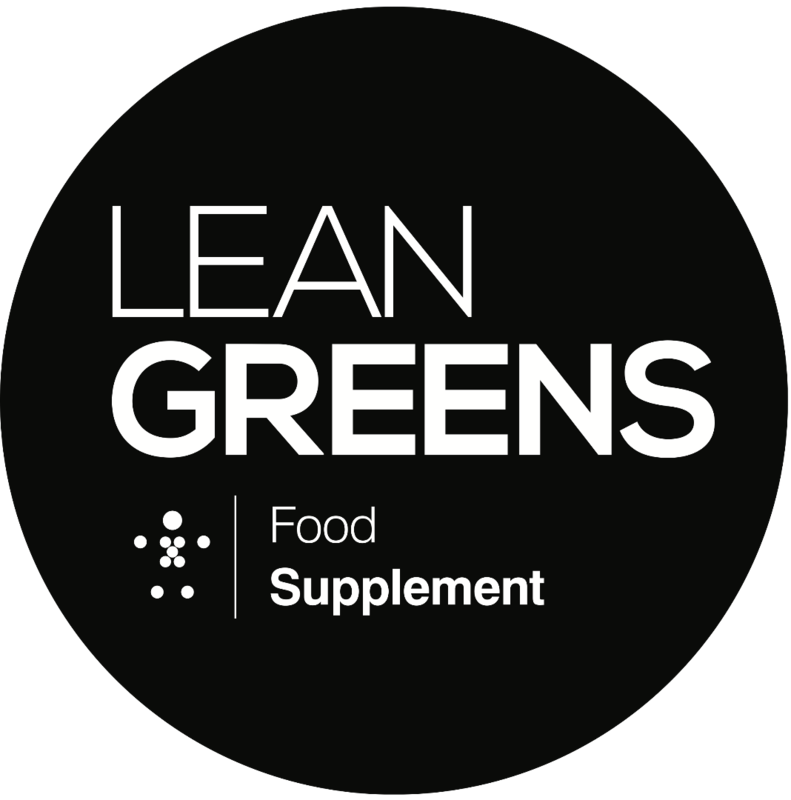 * Lean green's was recommended in Good Housekeeping sometime ago and I bought it based on that review. I take it everyday and find it keeps me on the straight and narrow with regards to my eating. I'm just an ordinary over 50's woman tryIng to keep healthy- I walk but no time for anything else fitness wise. Lean green's gives me a boost each morning and if I'm feeling a bit low I take another scoop before bed. Tim and Sam provide an excellent service. 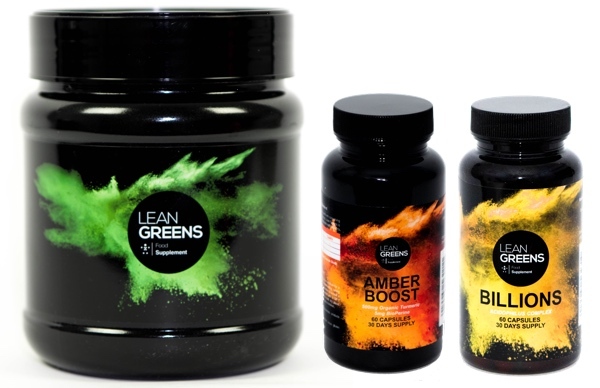 * My partner and I have been using Lean Greens for over a year now, I suffered with IBS and since taking Lean Greens it has helped me considerably, totally reduced bloating. We drink a glass each morning, first glass we had tasted a bit strange but now it's the first drink of the morning which sets us up for the day. 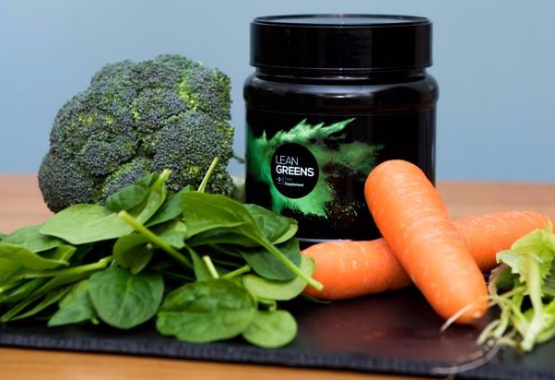 Would definitely recommend Lean Greens best Green drink I've tasted. * Love this stuff - I use it after a run and mix it with an electrolyte tab and it tastes pretty good. I sneak little bits into my son's smoothies and he's non the wiser. A great way to top up a healthy diet and the best customer service ever. * My husband and I have both been taking Lean Greens for just over a year now. It truly is a great product! Yes a tad on the expensive side but you get what you pay for. If we miss a day or run out we crave the wrong foods and start feeling rubbish. It has helped us both lose weight as we seem to be able to control our eating habits far better than before. Never had a problem with the taste.